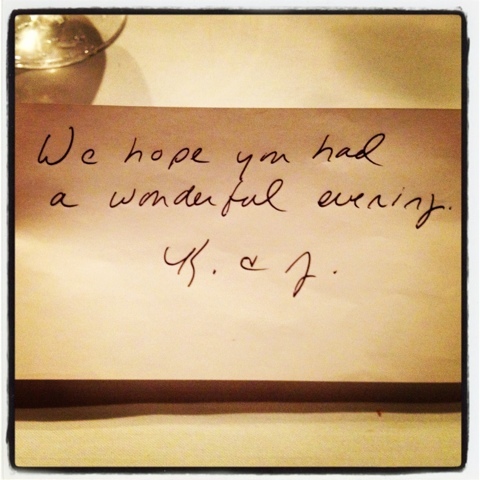 This note was left for us at dinner tonight by a couple who dined nearby that we never spoke to or even interacted with whatsoever. This note was slipped in with our bill, and our waiter informed us that our $100 meal had already been paid for by them. We are speechless. And grateful. And feel undeserving. THANK YOU to K. & J. for your generosity. You will never know what it meant to us. We had an amazing night. what a wonderful surprise! and so well deserved. That is amazing! I love stories like that and glad it happened to you! I don't know why that put tears in my eyes--maybe because we forget what a simple act of kindness can do for someone else. Glad you shared and glad it was your family who was blessed! That is so amazing. Good to know that true random acts of kindness still exist. It brought tears to my eyes too! Wow, that's an awesome thing to do. Random, unexpected acts of kindness can mean so much. That is awesome! I'm so glad I found your blog. It's just inspiring and wonderful and I love your hooligans (and their names!) Good things happen and I'm glad this good thing happened to you. I came to your blog via Thoughts from Paris. So glad you guys got to meet. This is a truly amazing story and I feel so happy that you posted this :) I'm a true believer in the kindness of strangers and this confirms just how wonderful people can be! I always read stories like this on iamakindstranger.com and I think that this would be a perfect addition to that site. Thanks for brightening my day!